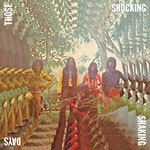 Those Shocking, Shaking Days: Indonesian Hard, Psychedelic, Progressive Rock and Funk, 1970-1978. The untold story of indonesia's various underground 70s musical scenes, largely underground as a result of strict censorship imposed by the dictator Suharto. Those who performed music marked by relentless fuzz, over the top, politically charged lyrics, strong rhythms and a cranky low-fidelity were truly rebellious. Fully restored and remastered audio. 64 page book included, with extensive liner notes by Egon, Jason ''Moss'' Connoy, and Indonesian researcher Chandra Drews, photographs and ephemera.